Its been a while since my last blog hasn't it?! I have been extremely busy (and having lots of fun) producing these little ones. This is my Thread sketch Collection. These little sketches are all closely based on my previous designs. Each one is 13 x 20cm (5 x 8") and comes fully framed. There are multiple versions available of each one. 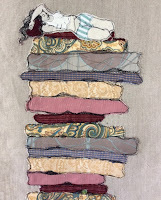 I have so loved revisiting these girls and enjoyed the challenge of redesigning them small scale. These little thread sketches will all soon be available to purchase online via my brand new website which is currently a work in progress! In the meantime if you see anything that takes your fancy please get in touch! 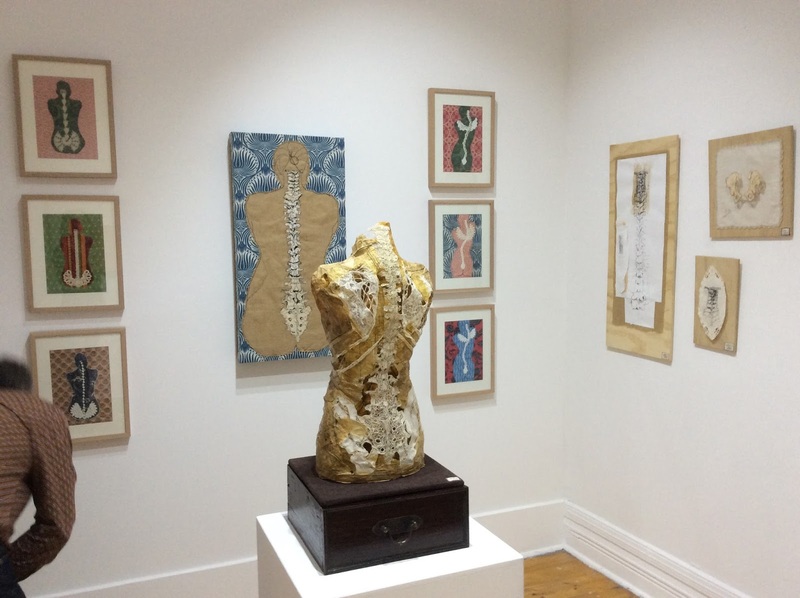 Amazing Young Artists astound at Kingston Arts! What a privilege it has been to teach such an amazingly talented bunch of budding young artists these July school holidays at Kingston Arts Centre. We've had so much fun in the cool Creative Lounge doing Dynamic Drawing, producing Sensational Sculptures and being Drawn2Print! Cant wait to do it all again next holidays. 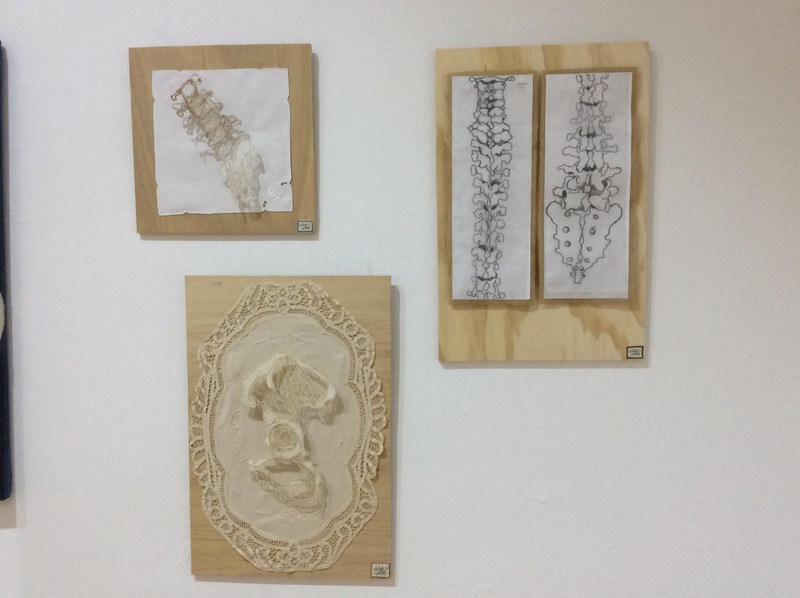 Anatomy Drawings and studies from my exhibition "Veritas"
What an amazing experience it has been to exhibit this body of work "Veritas". Thank you Brunswick Street Gallery for hosting my solo exhibition! I have been quite overwhelmed by the fantastic response to my work which has meant the world to me because all the pieces in this show truly come from the deepest parts of myself and are made with great passion, many hours of hard work and above all love. The process of putting this show together over the past year has taught me many things: that it is absolutely essential to follow ones heart, stay true to yourself and not listen to self doubt; that it is really really important to keep exhibiting your artwork; and if artistic endeavors are pursued with integrity then we can hold our heads high at exhibition time - hard work does pay off, never despair! 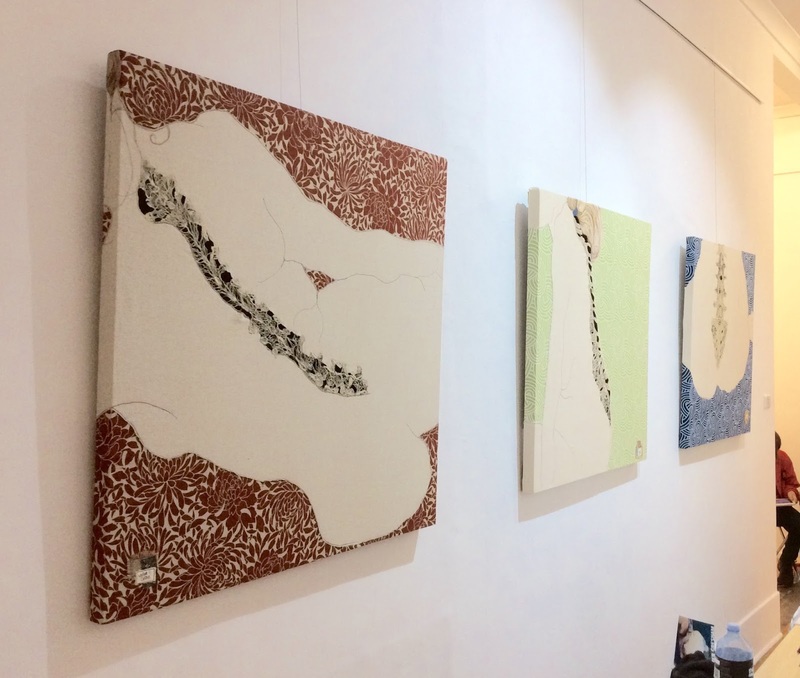 Veritas, solo exhibition opens this week! Veritas was the Roman goddess of truth. Known to be elusive, she was the mother of Virtue. The work in this exhibition represents a woman's inward journey in search of the ever elusive Truth. Who are we beneath our clothes and beneath our skins? As the layers fall away we discover our fundamental core truth. The core is about being authentically and powerfully oneself with all the beautiful imperfections, eccentricities, and fragility that might entail. I was born in Scotland and studied Fine Art (sculpture) in Edinburgh. 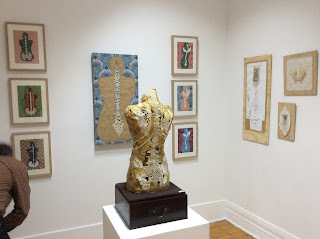 I have continued to create and study sculpture, drawing, mixed media & traditional craft forms and have been exhibiting my art in Melbourne since 2007.In recent years I have been exploring textiles to construct thread and fabric life drawings that express my love of the human form and seek to convey authentic human experience from my own perspective as a woman. 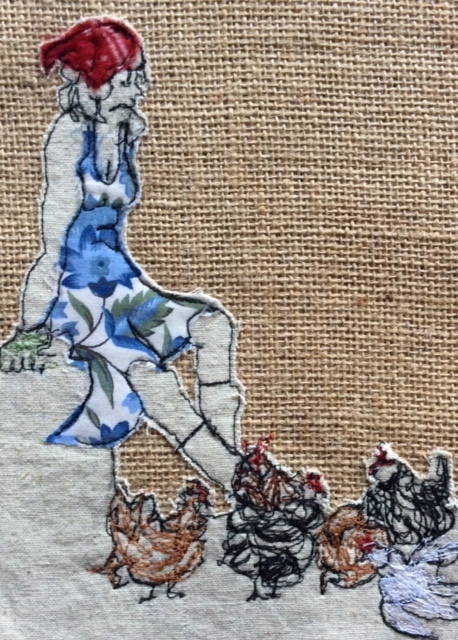 Drawing is the foundation of all my artwork and I constantly strive to portray the immediacy and spontaneity of the drawn line in my sculpture and textile pieces. 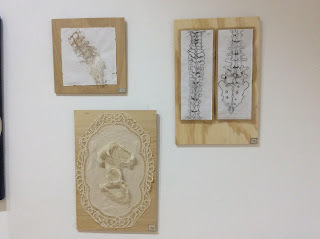 My love and fascination for human anatomy has always been a strong influence and theme in my work and I am particularly drawn to, some might say obsessed with, the spine, both as an exquisitely beautiful physical structure that I never tire of portraying and as an intriguing metaphor that to me expresses our fundamental core human state where fragility and strength coexist. 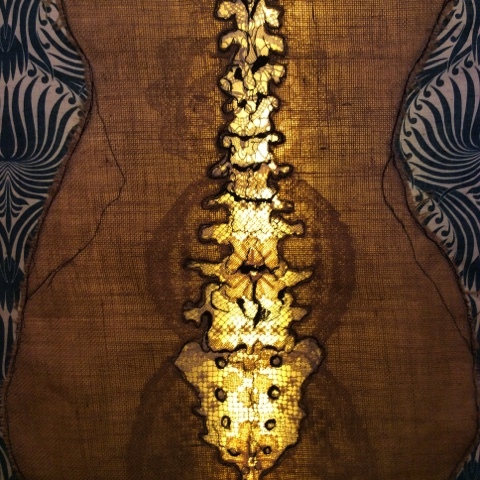 The spine is beautiful and fragile like lace, yet its structure gives it strength. The women I portray are at once strong, fragile, beautiful and elusive. 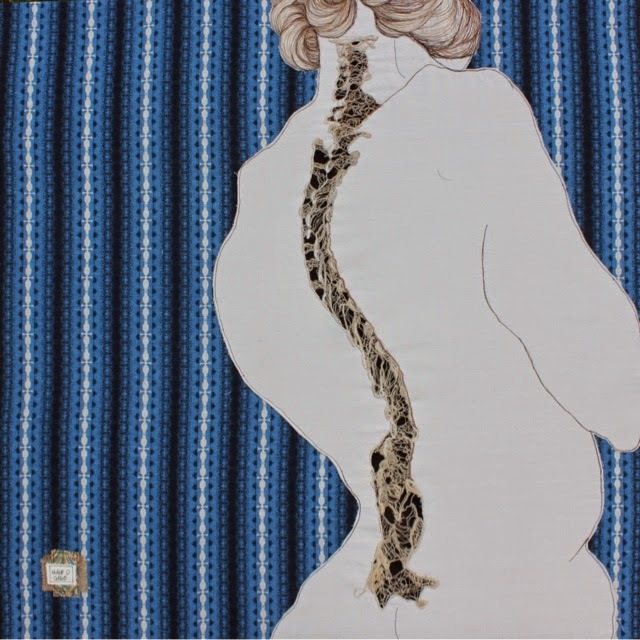 The exposed spine represents their core authentic self: imperfect, delicate and powerful, inextricably woven with their traditions and culture. 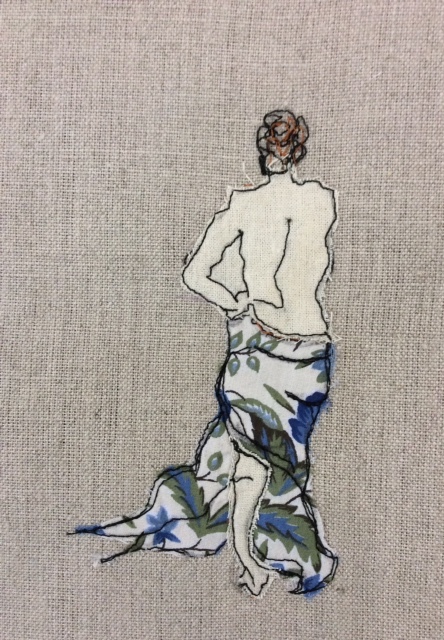 Whilst my artistic endeavours come firmly from a fine art foundation I do not consider any material to be unworthy of use - each medium and combination of mediums has a language all of its own and in recent years I have wholeheartedly embraced embroidery/ textiles for their expressive capacity. 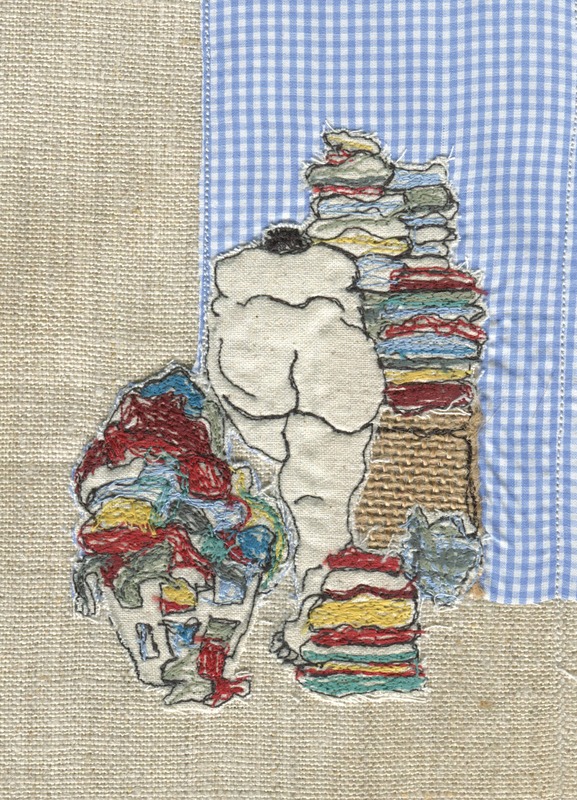 There is a humility to embroidered artefacts, relegated as they have been to a female domestic setting. Yet despite their often lowly status they represent hours of highly skilled workmanship, skills passed down by generations of women. As a result of their historical place firmly rooted in the domain of women, there is an inescapable femininity to any embroidered piece. Aesthetically, I adore the honesty, beauty and directness of the drawn line translated to thread. I have come to conceptualise my work in this medium as constructed drawings. 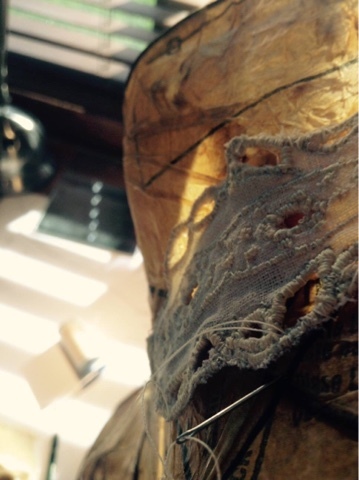 The use of found objects has long been an important part of my artistic practice. 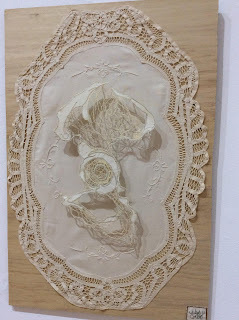 My every growing collection of preloved table linen, crochet doilies, napkins etc have finally found their way into this recent series of works. The napkins and tablecloths are beautiful yet useful objects. Some are the result of hours of detailed work, done by hand, by women, perhaps in the company of a circle of women. There is a history to them, they hold the stories of the women who made them, the women who taught the skills to those who made them and of those who used them. 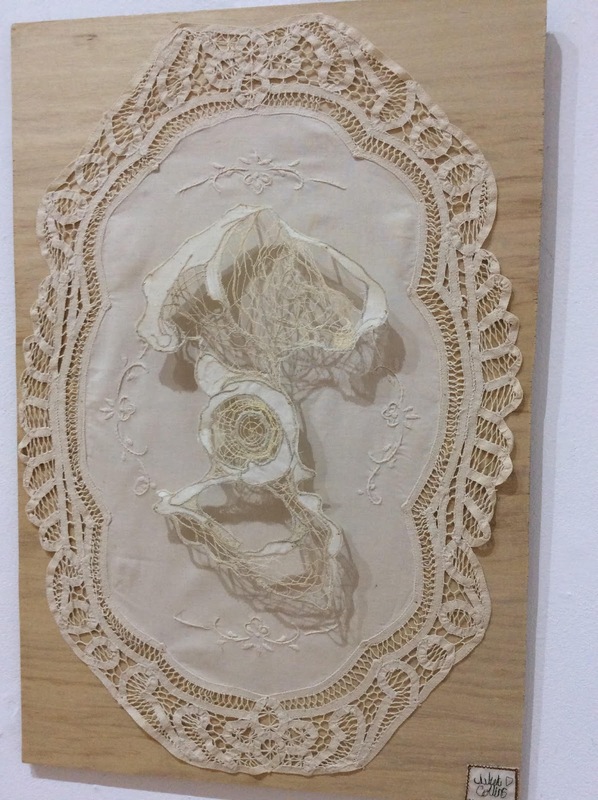 Domestic, feminine and humble, I have selected them and used them in these works for their beauty, their implied reflective narrative, and the message conveyed by the juxtaposition of the women or anatomies I have embroidered or placed upon them. Truth can mean many things: it can be intangible; it can be sought; it can remain elusive; it can be covered up; it can be revealed. Truth can be exposed. Some truths are harsh, base and hard to face. Being true to ourselves can be uncomfortable, antisocial, fun, pleasant. Knowing our own truths can allow a more true expression of our personal authenticity and uniqueness. It can bring to us a deeper and more authentic connection with others. 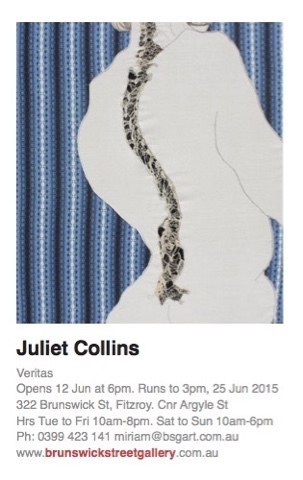 Veritas opens this Friday 12th July at Brunswick Street Gallery, Fitzroy. Please join me at the opening 6-9pm. I've been very busy finishing off work for my solo show "Veritas", which opens at Brunswick Street Gallery on 12th June. The pieces that will be exhibited have all been created over the past year or so. In truth they have been with me much longer, lurking in my creative consciousness, waiting to be brought into the world. 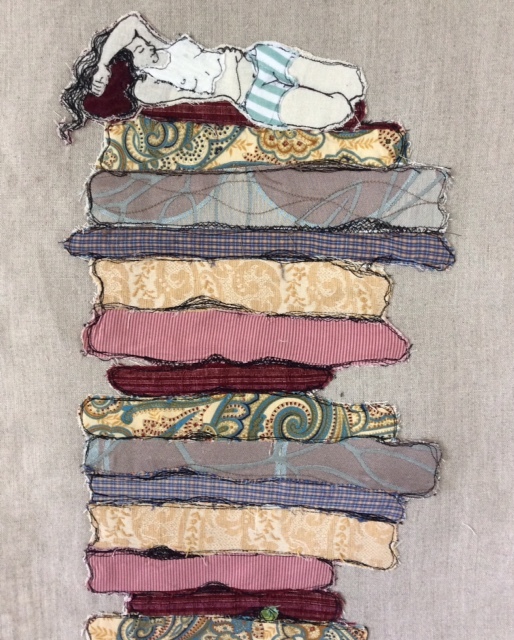 They are stitched together with the theme of Veritas, meaning truth, and in most I have indulged my obsession with anatomy, developing my life drawings into artworks that explore internal structures, particularly the spine and that develop my long held concepts around the spine being a metaphor for our deep inner truth. Solo show opening June 12th! I seek to express my wonder of the processes of nature; my awe at the beauty of the human form and psyche; and my fascination with discovering the mysteries exposed in the layers and structures within forms. 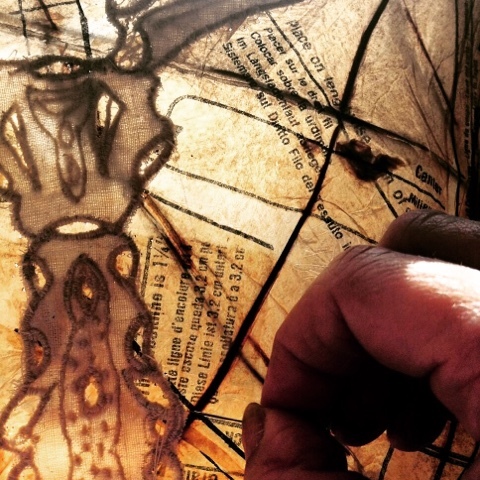 In sculpture I am currently working with steel, copper, plaster and found natural objects. 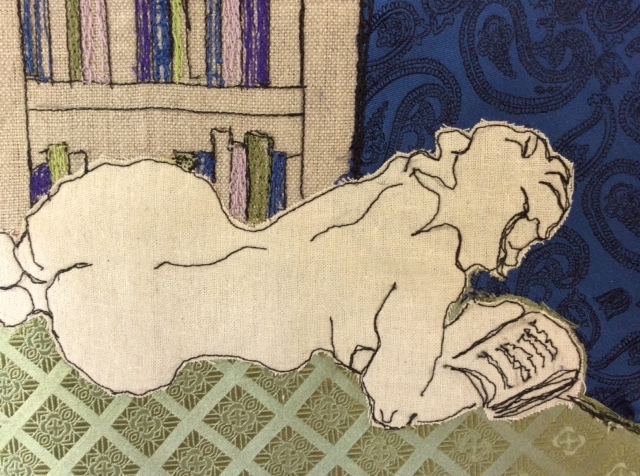 In 2D I am exploring textiles to create life drawings in embroidered thread, fabrics and felted wool.